This blog explains how to load external data source to c4c. When some amount of data is not there in C4C, you want to bring into C4C and use the data for analytics. Once data is in C4C, we can merge the data source with existing data sources through inner or outer join. If you are loading a confidential data, for security of information you need to join with existing data source, that’s when the data security of C4C data source will be applied also to Cloud data source. The respective details of fields in the source system like field name,Field ID,can be referenced with C4C existing data sources key fields eg. Referencing account field from third party will be referenced from to CODACCOUNT data source and BP_INT_ID key field in C4C . User can make the Fields primary as per the requirement. Once all the required fields from external source are created in C4C as seen in screenshot above, the Cloud data source is saved , user can download the template from the Download Template button from design data source screen. Navigation: Goto-> Design data source screen-> Search for already created cloud data source -> Click on download template. The CSV can be filled with data from external source . Fill in the file with relevant data and click on button DATA to upload the CSV file. 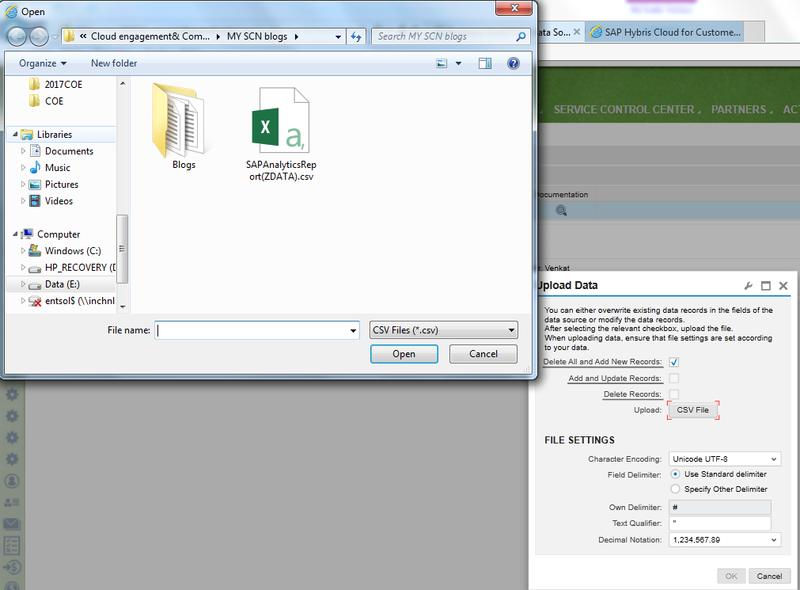 In upload data screen, select the file settings , select field delimiter , upload the CSV file with data filled.